Location: Newmarket-on-Fergus, County Clare, Ireland. Condition: Intact. Now a 5-star luxury hotel with golf course. Ownership / Access: Bernard McDonough. 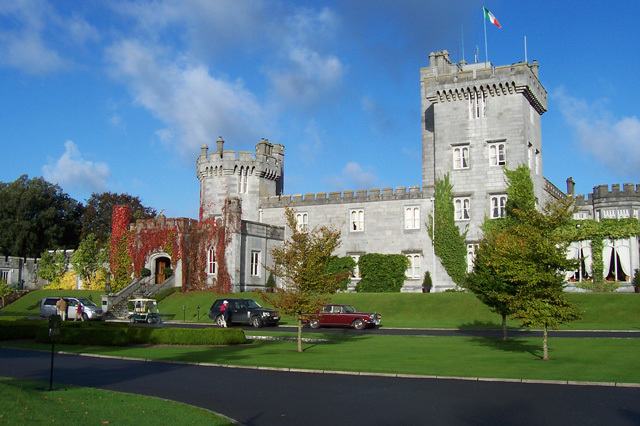 Notes: Dromoland Castle (Irish: Drom Olainn) is a castle, now a 5-star luxury hotel with golf course, located near Newmarket-on-Fergus in County Clare, Ireland. Its restaurant, the Earl of Thomond, was awarded a Michelin star in 1995, under head chef Jean Baptiste Molinari. The present building was completed in 1835. However, the first building constructed here seems to have been a tower house built in the 15th or early 16th century and is recorded as being erected by Thomas, the son of Shane Mac Anerheny. There were at least three houses on the site, at various times, called Dromoland. While Dromoland later became residence of eight generations of the O'Brien family, early records suggest that the area was also occupied by other local Gaelic families, such as the McInerney family during the 16th century. According to the historian James Frost, Dromoland translates as the "Hill of Litigation".